We cleaned out the fridge to make room for any new sauces that we’d be opening soon, and found bottles of stuff that was over 6 years old. There was even a bottle of smoked, dried tomatoes in olive oil that was at least 7 years old. These photos don’t show the 2 dozen or so bottles of other sauces and condiments that we threw out. 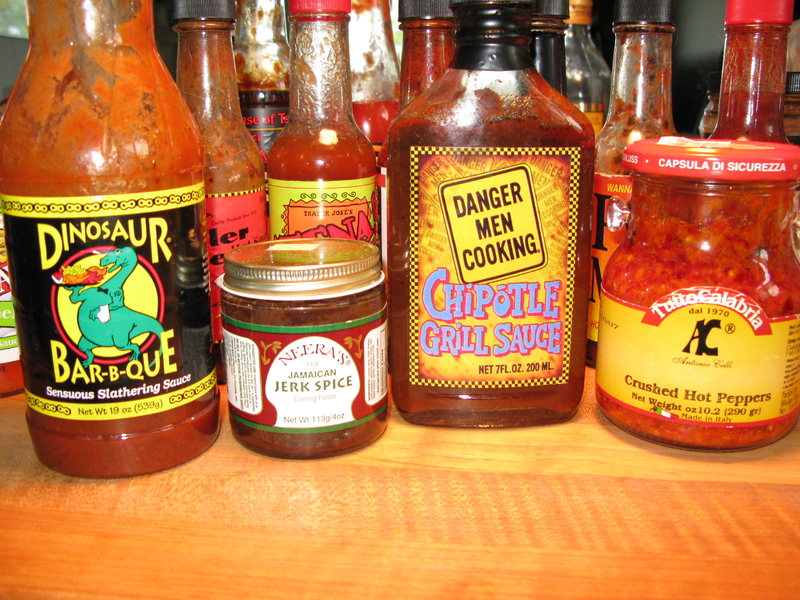 There were Thai and other oriental sauces and seasonings – taco sauces, steak sauces, BBQ sauces, bottled peppers and pickles – they all had to be recycled to make room for the new guys! Crabanero – The Original Old Bay Seasoned Habanero Sauce – from the Philly Chili Co. produced in Reading, PA. Marilyn loves this stuff, and it was our 2nd bottle, which we probably purchased at Peppers.com but they have since added CraBBQ sauce and Crabanero Bay seasoning to their line up. Might be a future review in line for them. Killer Bee from VirginiaBrand.com – apparently they’ve stopped making this sauce. Too bad, it was a nice, sweet hot sauce. Tena Hot Sauce – Trader Joe’s product made in Ecuador from Tena Pepper Paste. Blair’s After Death Sauce – ’nuff said. The Greatest Grub Ever Fire It Up Serving Sauce – we got a mixed case of TGGE products at the Food Network’s Food Show in Pa a few years back. Great tasting stuff, but I forgot it was even there. PyroMania Hot Sauce – One of my favorite sauces – chunky, sweet, hot, vinegar – from Garden Row Foods in St Charles, IL it’s available from HotShotsHotSauce.com here. Mad Dog 357 – back when 357,000 Scoville Units was a big deal. I love Mad Dog Inferno, but I guess this didn’t pass the muster. Santa’s Atkin’s Friendly – nevermind, even the website is a link farm now. Parada – a Brazillian sauce. Eh. Just for grins, here’s a shot of our fridge door AFTER the clean out. Hey! There’s still alot of hot sauces in the bottom of that door! Hee-hee. The End… or is it…? Thanks Scott, but 4 or 5 bottles a month? I just can’t bring myself to do that! And we just do without milk or eggs… or food, if there’s no room for them. Ha! 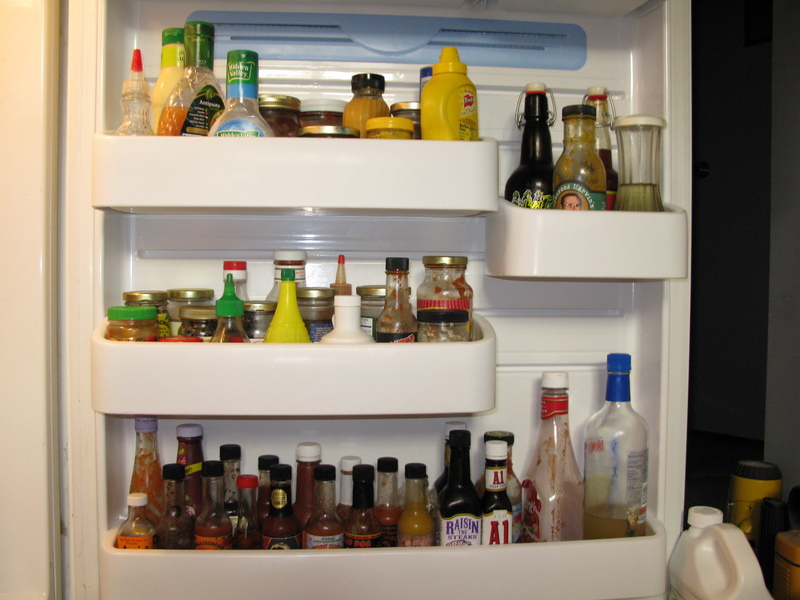 Well, I just got rid of about 25-30 bottles and jars of sauces, jellies, salsas, and other miscellaneous stuff. It hurt, because I had to throw away some of my precious super-hots such as Blair’s and DEFCON. Good sauces, but I couldn’t use all of them up in time, and now they’re 2-3 years old. I didn’t photo-document it because I cleaned out all kinds of other leftovers and spoiled/rotten food. Now if I can just go through the 50-60 bottles and jars of spicy stuff on my pantry shelves, we’d have room for food again! I had some hot sauce that was never opened, but the date on it is 9/25/05. It was not refridgerated either. Can I still use this? 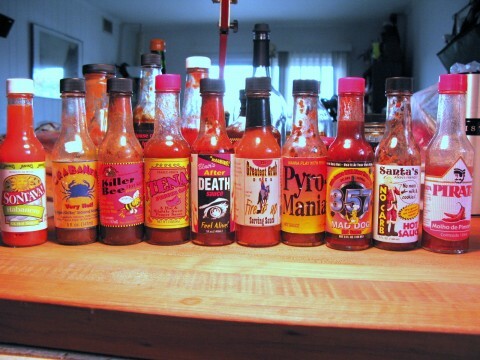 Patty, some folks think hot sauce never goes bad. But I wouldn’t trust a bottle that was 4 years old. What is the brand and name of the hot sauce you have? I know this is an old post but I’d figured I’d chime in and offer a few words that might make you feel better about this in the future. While I understand what it feels like to toss a half used bottle of sauce, keep in mind that all of those bottles had seen some love. It wasn’t for naught. My father, (the dude is my best friend but I’d never let him know my frustration with this) is guilty of collecting sauces and leaving them in the pantry for as long as yours have been in the fridge. Every time I’m over at his house I’ll raid the fridge and find 2 open bottles of sauce and 20 unopened ones in the closet.